How is the vapor barrier installed? Proper installation is critical. The vapor barrier needs to cover all of the dirt completely and also be properly sealed. In addition the concrete footing and at least part of the foundation wall need to be covered as well. Some homeowners prefer to cover the entire foundation wall. This helps prevent any moisture from escaping and also give the space a uniform look. We tape all of the seams using a polyethylene UV resistant tape. This will give the vapor barrier a water proof seal at the seams. The polyethylene plastic needs to be attached firmly to the concrete foundation wall and any concrete piers. We use a double sided aggressively reinforced black butyl rubber tape. The key is that it is non hardening and remains flexible and sticky during all seasons in the northwest. In addition we drill ¼ inch holes in the foundation every 2 -3 feet and install Foundation Pins to permanently secure the Vapor Barrier to the foundation wall. 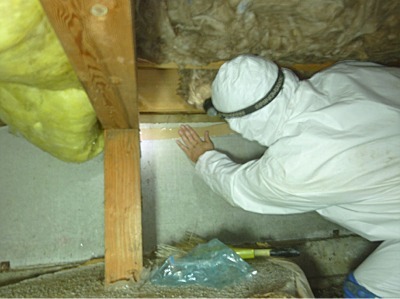 This will ensure that year after year the vapor barrier will still be attached to the foundation walls. Some contractors use adhesive caulks to “glue” the polyethylene to the foundation. This method may work fine during the warmer summer months but the caulk tends to harden over time, especially during the winter months and can potentially detach from concrete surfaces. Ask your contractor what they are using to secure the vapor barrier to your foundation wall. Every professional uses a mechanical fastener.